Matt Huegel turned in another terrific feature for SoxProspects.com, this time on PawSox left-hander Brian Johnson. Johnson is healthy this season after pitching through some discomfort in his throwing elbow early last year which eventually caused him to cut his season short on August 2. We have also updated our rankings, with notable jumps from Yankory Pimentel (20th), Victor Diaz (31st), and Luis Alejandro Basabe (34th). The full rankings list can be found here, with past rankings lists being found here. Moncada, Benintendi, Espinoza, and others were also featured by Sam Dykstra for MiLB.com's Red Sox Prospect Primer. Sam Travis shined offensively in spring training for the Red Sox and could be on the verge of making his big-league debut. Christopher Smith of MassLive.com pondered when that debut could come. Bill Koch of the Providence Journal wrote a season preview for the PawSox with some quotes from manager Kevin Boles on the success of Travis Shaw and a hungry Henry Owens. Owens dazzled in his season debut for Pawtucket, firing six shutout innings and striking out eight. The Portland Sea Dogs may lack the flashy names, but certainly include some interesting guys in the rotation and bullpen to keep an eye on this season. Wendell Rijo and Henry Ramos are the only position players for Portland ranked inside the top 25 at SoxProspects.com. Kevin Thomas of the Portland Press Herald has more on the Sea Dogs in his season preview. The Salem Red Sox have gained a lot of attention early in the 2016 season, and for good reason. The team is loaded with top-tier talent, including three of the top four prospects at SoxProspects.com, four of the top ten, and seven of the top 20. Baseball America recently ranked Salem as the top Opening Day roster in all of the minors. MLB.com also dubbed Salem as the most talented team in the minor leagues. Alex Speier of the Boston Globe also wrote about the talent in Salem, along with some other notes on the rest of the system. Aaron McFarling of The Roanoke Times also hopped on the Salem hype train with an article on the team, including new manager Joe Oliver's perspective. Ken Laird of WEEI.com also wrote about why everybody should care about the Salem Red Sox if you care about the future of the big club. With most of the attention on Moncada, Benintendi, and Rafael Devers, Laird also wrote a very nice piece focusing on shortstop Mauricio Dubon. 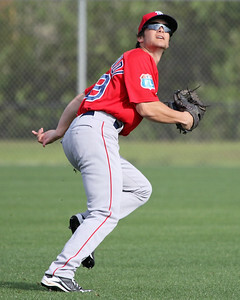 Dubon gained a lot of experience in Salem last season and appeared in both Red Sox spring training games in Montreal. J.J. Cooper of Baseball America wrote about the youngest players in each league for the major leagues and minor leagues. The Red Sox are very well represented, with the two youngest players in the South Atlantic League (Espinoza and Roniel Raudes), three of the ten youngest players in the Carolina League (Devers, Dedgar Jimenez, Nick Longhi), the youngest player in the Eastern League (Wendell Rijo), and the eighth youngest player in the International League (Travis). Kevin McNamara of the Providence Journal wrote about Pat Light, who now has a full year of experience of being a reliever under his belt. Light also comes into the season having fine-tuned his mechanics to avoid tipping his pitches. Brenden McGair of the Pawtucket Times took a look at some storylines to watch for in Pawtucket, highlighting Owens, Johnson, Travis, and Allen Craig. Myron Hosea of Greenville Online wrote a preview of the 2016 Drive roster. Portland was named the best road city in the minors, according to Baseball America. Stankiewicz (pictured, left) was terrific in his Portland Sea Dogs debut on Sunday. He allowed an earned run in the second inning but tossed four shutout innings after that. He was in line for a win when he left the game, but the Portland bullpen surrendered the lead late in the game. He induced a double play ball and recorded a strikeout in every inning except the third. Witte is off to a scorching start for the Sea Dogs. He homered on Opening Day, then recorded a multi-hit game in each of the next three games, including a pair of three-hit performances. He also had the most hits, home runs, runs, and RBI in the Red Sox minor league system this past week. Witte is a 26-year old who has been in the Sox system since 2013. He spent all of 2015 in Portland and hit .283/.363/.414.